Astronomers using NASA’s Hubble Space Telescope have uncovered surprising new clues about a hefty, rapidly aging star whose behavior has never been seen before in our Milky Way galaxy. In fact, the star is so weird that astronomers have nicknamed it “Nasty 1,” a play on its catalog name of NaSt1. The star may represent a brief transitory stage in the evolution of extremely massive stars. But Nasty 1 doesn’t look like a typical Wolf-Rayet star. The astronomers using Hubble had expected to see twin lobes of gas flowing from opposite sides of the star, perhaps similar to those emanating from the massive star Eta Carinae, which is a Wolf-Rayet candidate. Instead, Hubble revealed a pancake-shaped disk of gas encircling the star. The vast disk is nearly 2 trillion miles wide, and may have formed from an unseen companion star that snacked on the outer envelope of the newly formed Wolf-Rayet. Based on current estimates, the nebula surrounding the stars is just a few thousand years old, and as close as 3,000 light-years from Earth. A remote galaxy shining with the light of more than 300 trillion suns has been discovered using data from NASA’s Wide-field Infrared Survey Explorer (WISE). The galaxy is the most luminous galaxy found to date and belongs to a new class of objects recently discovered by WISE — extremely luminous infrared galaxies, or ELIRGs. “We are looking at a very intense phase of galaxy evolution,” said Chao-Wei Tsai of NASA’s Jet Propulsion Laboratory (JPL) in Pasadena, California, lead author of a new report appearing in the May 22 issue of The Astrophysical Journal. “This dazzling light may be from the main growth spurt of the galaxy’s black hole. The brilliant galaxy, known as WISE J224607.57-052635.0, may have a behemoth black hole at its belly, gorging itself on gas. Supermassive black holes draw gas and matter into a disk around them, heating the disk to roaring temperatures of millions of degrees and blasting out high-energy, visible, ultraviolet, and X-ray light. The light is blocked by surrounding cocoons of dust. As the dust heats up, it radiates infrared light. A team of Australian and Spanish astronomers have caught a greedy galaxy gobbling on its neighbours and leaving crumbs of evidence about its dietary past. Galaxies grow by churning loose gas from their surroundings into new stars, or by swallowing neighbouring galaxies whole. However, they normally leave very few traces of their cannibalistic habits. A study published today in Monthly Notices of the Royal Astronomical Society (MNRAS) not only reveals a spiral galaxy devouring a nearby compact dwarf galaxy, but shows evidence of its past galactic snacks in unprecedented detail. Australian Astronomical Observatory (AAO) and Macquarie University astrophysicist, Ángel R. López-Sánchez, and his collaborators have been studying the galaxy NGC 1512 to see if its chemical story matches its physical appearance. 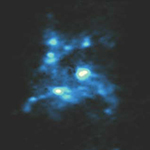 A research team led by Dr. Hauyu Liu at the Institute of Astronomy and Astrophysics, Academia Sinica (ASIAA) observed the luminous OB cluster-forming massive molecular clump G33.92+0.11 with the Atacama Large Millimeter/submillimeter Array (ALMA), and unveiled the fine molecular gas structures deeply embedded at the center of the parent molecular cloud. This finding provides a greatly simplified picture of overall cloud geometry and kinematics, which represents a crucial step forward in the understanding of the upper end of the stellar and molecular core mass functions. 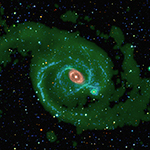 The research was published in the April 28 issue of The Astrophysical Journal. Via ALMA observations, this research for the first time resolved an embedded giant coherent dense gas structure on a several light-year scale. Surprisingly, this dense gas structure presents several spiral arms, which appear like a version of the previously observed spiral arms surrounding the low-mass protobinary, scaled-up by a factor of ~103. These giant spiral arms, and the massive molecular gas cores located at their convergence, are cradles to form the highest mass stars in this stellar cluster. The origin of type Ia supernovae, the standard candles used to reveal the presence of dark energy in the universe, is one of astronomy’s most beguiling mysteries. Astronomers know they occur when a white dwarf explodes in a binary system with another star, but the properties of that second star — and how it triggers the explosion — have remained elusive for decades. Now, a team of astronomers from the intermediate Palomar Transient Factory (iPTF), including those associated with UC Santa Barbara, have witnessed a supernova smashing into a nearby star, shocking it, and creating an ultraviolet glow that reveals the size of the companion. The discovery involved the rapid response and coordination of iPTF, NASA’s Swift satellite and the new capabilities of the Las Cumbres Observatory Global Telescope Network (LCOGT). On May 19, the LIGO Scientific Collaboration (LSC) will dedicate their second-generation gravitational-wave detectors (aLIGO) in a ceremony at the Hanford detector site. Researchers at the Max Planck Institute for Gravitational Physics (Albert Einstein Institute; AEI) in Hannover and Potsdam, Germany, have made significant contributions in several key areas: custom-made high-power laser systems required for the high-precision measurements, efficient data analysis methods running on powerful computer clusters, and accurate waveform models to detect gravitational waves and extract astrophysical information. The AEI is a leading partner in the international gravitational-wave science community, and its researchers keep pushing the boundaries of science on the way to the first direct detection of gravitational waves. This will open a new window to the otherwise invisible “dark” side of the Universe and mark the beginning of gravitational-wave astronomy. Gravitational waves are ripples in space-time that are emitted by cataclysmic cosmic events such as exploding stars, merging black holes and/or neutron stars, and rapidly rotating compact stellar remnants. These waves were predicted in 1916 by Albert Einstein as a consequence of his general theory of relativity, but have never been observed directly. At their design sensitivity, the aLIGO instruments should detect multiple gravitational-wave events each year.